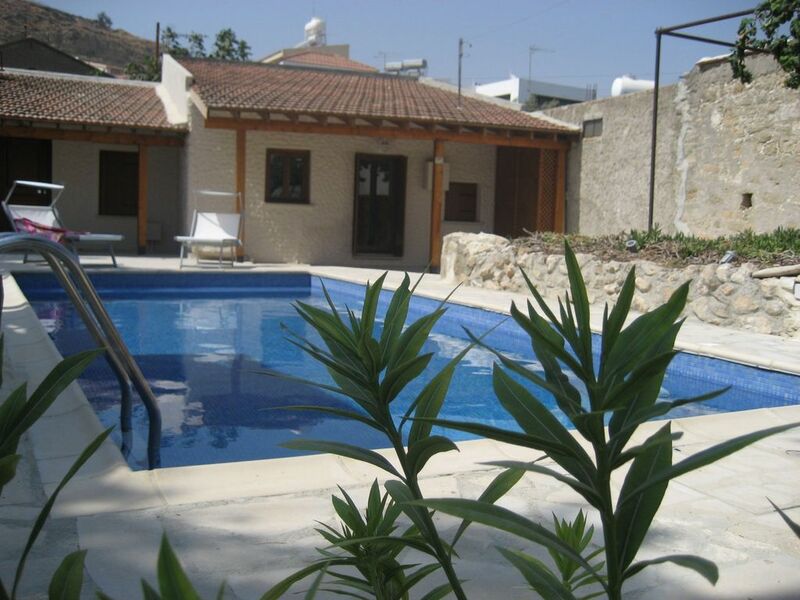 The cottage is a lovely traditional Cypriot cottage originally built more than 100 years ago. The current owners have fully refurbished and updated the interior to offer luxurious and comfortable surrounds. It is less than a 2 minute walk from the village square with its tavernas, banks, supermarket and coffee shops. Visitors are greeted by an open courtyard with an outdoor swimming pool. An outside single storey wooden pergola offers beautiful views out to sea whilst providing shade and opportunities for outdoor dining. Accommodation is divided into the main house with 2 bedrooms and a separate self contained annexe. The main house has a living room, 1 double and one single (can sleep 2) bedrooms. Both the kitchen (Miele fridge/freezer, hob/oven, dishwasher and microwave)and bathroom (ceramic tiling, wide shower-head) have modern fittings. Wide screen TV, DVD player, iPod dock is available for guests’ use. Broadband is provided free of charge. The annexe comprises of a single double bedroom and an en-suite shower room. A utility room houses a washing machine, iron and ironing board. Hot water is provided by solar panels with an immersion heater for the cooler months. Larnaca Airport is an hour and half away by car an Paphos Airport is just under half an hour away. This is our 'home from home'. We've enjoyed coming to our lovely cottage for over 20 years now. It has had a rebirth in the last few years and now will provide any traveller with all the comforts required, whether as a couple, single traveller or family. Melanda Cottage is set up to cater for all your holiday needs. The cottage is near the village square but secluded enough for you to enjoy complete privacy and security. As a family we've kitted it out to make traveling with children effortless- you should have everything you might need. We really do hope you'll love it as much as we do! Accommodation was great suited us very well and within walking distance of village, well maintained and we felt very much at home there. You're very kind and I am so pleased Melanda served you well. I look forward to welcoming you back in the future. Enjoyed our stay. Found that the setting was ideal for our wishes. One or two problems with some of the various pieces of equipment. We couldn't get the toaster to work. We had a problem with the DVD player - it either jumped or froze, but these were minor problems in the context of the general enjoyment of the holiday. Had a fab week in Melanda Cottage . Perfect location but manages to still be very peaceful - all the amenities you would need and a lovely pool . So pleased Melanda served you well. Look forward to welcoming you back at any time. Exactly as described, peaceful, and ideal. We were a party of 6 (4 adults and 2 young children) and stayed for two weeks starting at the end of July, and had the most relaxing holiday. The property was ideal, with a separate room and ensue for the grandparents, and the main building for a family of 3 adults and 2 children with kitchen, lounge, and it's own bathroom. The cottage is virtually hidden and therefore benefits from peace and quiet. It is situated in Pissouri village (not Pissouri Bay, although that is within easy reach), and just a stone's throw from the village square complete with a variety of good value restaurants providing a high standard of food for all tastes, including a genuine British Fish & Chip shop for those who need a change from souvlaki. The property is described as charming, and that is right on the button.It was a pleasure dealing with Nara, and it was a pity that we did not have the opportunity of meeting her. Altogether, the holiday was a complete success for two old-us, and my daughters family, including grandsons aged 2 and 5. We spent a lot of time in the eminently suitable pool! Almost immediately on arrival we felt part of the village community, and nothing was too much trouble for the villagers if you needed aything at all. A wonderful holiday in a wonderful place - what more could you want? Well, maybe a return visit!! Thank you for that wonderful feedback. It was an absolute pleasure to have you stay and would love to have you back. Short walk to the town centre with lots of restaurants. Enjoyed cooling down in the pool. Pissouri Village is set on a hillside about 900m above the sea with dramatic views of the surrounding countryside which you'll be able to enjoy from your terrace. The Troodos Mountains, Akrotiri Peninsula and Aphrodite's Rock all serve as wonderful geographical attractions, with the later only a short drive away. The village square, only 100m away with traditional coffee shops has a selection of charming tavernas serving local food. There is a weekly Cyprus Night in the square with a display of Greek dancing and music. Happily the Cottage enjoys a secluded location so whether you indulge in the local nightlife or not, is up to you! A short drive to the beach opens up a whole new area of relaxation and fun. The Bay of Pissouri with the deep blue Mediterranean provides an ideal backdrop to any water based activity you'd like to pursue. It's tranquil scenes are equally well placed for gentle reading and relaxation with the sound of the sea and captivating views of the Mediterranean. Swimming on a designated Blue Flag beach is enjoyed by all the holiday visitors. On the fringe of the beach are tavernas serving refreshing drinks and delicious local dishes. Water sports, such as sailing, wind surfing, water skiing, with private lessons, are available. Nearby are many ancient Greek and Roman temples, villas and mosaics at Curium, Kouklia and Paphos. Pissouri is a charming, small village with traditional Cypriot hospitality, steeped in tradition where visitors staying and Melanda cottage can enjoy all modern amenities. Arrival not before 3pm (except by prior arrangement). Departure by 12 noon Air conditioning & WiFi included in prices There are NO EXTRAS to the above prices Car hire at good rates from a recommended company can be provided including meeting at airport or delivery to the villa.